The figure used for this unit is a Star Wars figure from the Masters of the Force set. Its model number and name are 25/Ewok Warrior. Character Bio - Ewok Scouts are some of the most brave and skilled members of the tribe. The Ewok Scouts advance to reconnoiter the enemy's position, then use their war horns to signal fellow tribesmen to emerge from their secretive jungle positions for the attack. Being a Scout, an Ewok Scout may benefit from Venoc Warlord's SCOUT LEADERSHIP special power. Being a Scout, an Ewok Scout may benefit from Brave Arrow's SCOUT MELEE ATTACK ENHANCEMENT special power. Being an Ewok Hero, an Ewok Scout may benefit from the Ewok Hunters' EWOK HERO BONDING turn bonding special power. Being an Ewok, an Ewok Scout may benefit from Logray's PROTECTION OF THE SHAMAN defense boosting special power. Being a figure who follows the Independent faction, an Ewok Scout may benefit from Jabba the Hutt's UNDERWORLD CONNECTIONS turn bonding special power. Ewok Common Squads may benefit from an Ewok Scout's CALL TO BATTLE special power. Current Ewok Common Squads include: Ewok Hunters. After attacking with an Ewok Scout, you may place one of your previously destroyed Ewok Common Squad figures on any empty space adjacent to an Ewok Scout you control or adjacent to an Evergreen Tree or Jungle Piece. When moving up or down you may double an Ewok Scout's height. 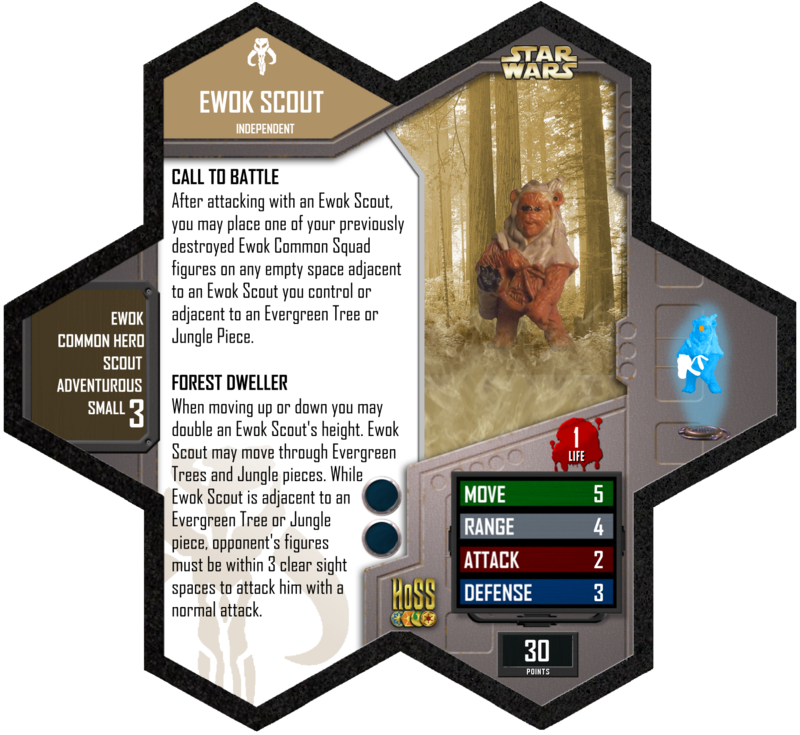 Ewok Scout may move through Evergreen Trees and Jungle Pieces. 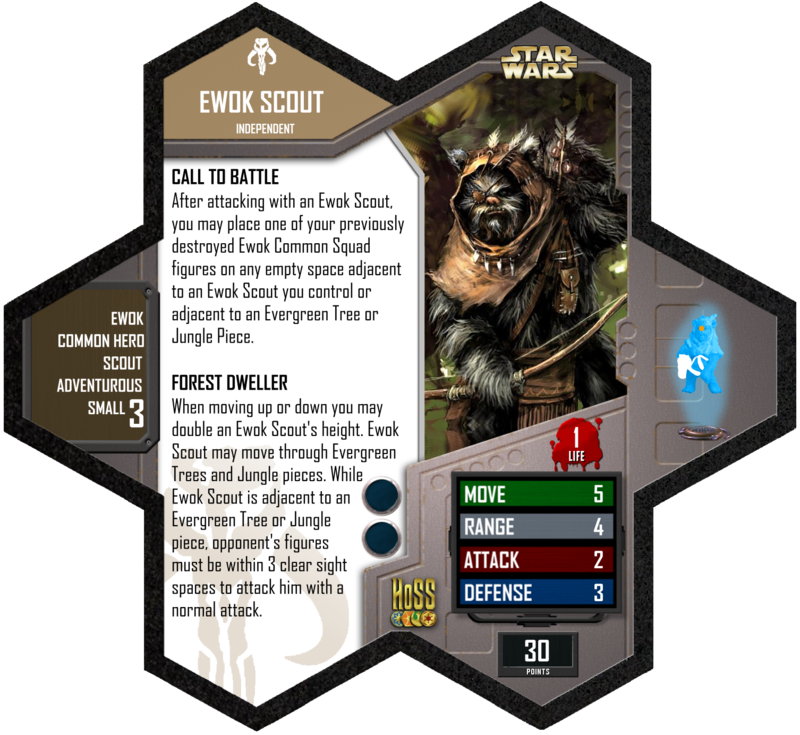 While Ewok Scout is adjacent to an Evergreen Tree or Jungle Piece, opponent's figures must be within 3 clear sight spaces to attack him with a normal attack. Last edited by Porkins; May 18th, 2016 at 05:49 PM.